It never ceases to amaze me how you can connect with people who are completely different from you. Maybe you don’t speak the same first language. Maybe you grew up on opposite sides of the world, or you were born in different decades. But somehow, despite all your differences—and perhaps against all odds—you find commonalities. And what’s more, sometimes you realize that below the surface, maybe you’re not actually all that different after all. Kiva’s mission is to connect people through lending. 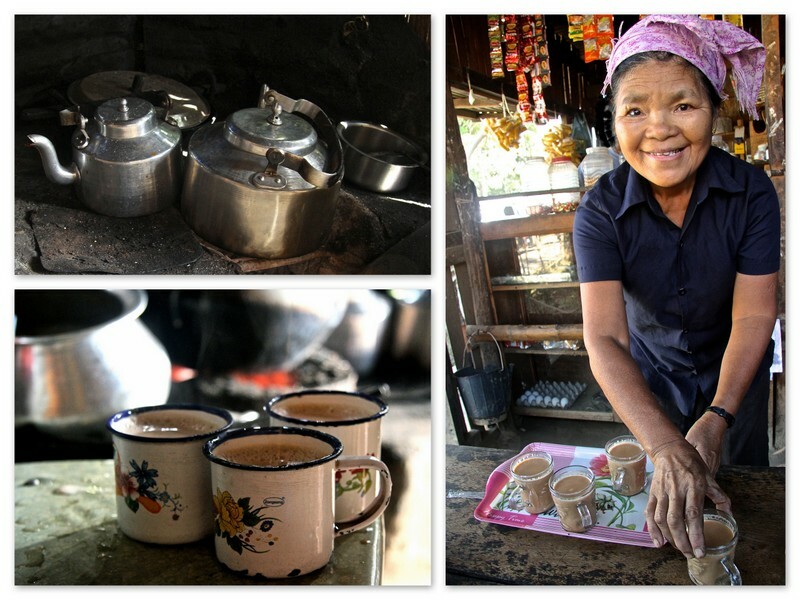 That happens every day through its online lending platform, http://www.kiva.org. But as Kiva Fellows, we have the opportunity to carry out this mission in the field. Sometimes we get to meet with borrowers, but all of us get to connect with the local people where we work and live. We learn about who they are and how they live, and we share a little bit about ourselves as well. And when you find yourself having a good laugh with them, it’s a pretty amazing thing. So, the three months of my fellowship are drawing to a close. It’s hard not to get sentimental when I think about leaving behind this beautiful country and the warm, generous people who welcomed me into their homes, their families, and their lives. Some took the time to get to know me, others took the time to share their stories, and others still simply made me feel at home, wherever I was. Many went out of their way to make sure I had a fantastic experience here. Pictured in this blog entry are just some of the wonderful Ticos that I met in Costa Rica. First time seeing toucans. They are too cute for words! First time riding on a moto, or motorbike, ever. (I think I’ve gained some street cred in Uganda). First time seeing dressage. One weekend, I chanced upon a big street party that was complete with cowboys and horses getting their horse ballet on. I thought that was pretty fortuitous, since I had recently learned what this sport was all about (courtesy of Stephen Colbert). First time eating rice and beans for 90 days straight. I’m talking about the famous typical Costa Rican dish, gallo pinto, which is pretty much what everyone here eats every day for breakfast—and sometimes lunch and dinner, too. OK, so maybe I didn’t eat it for all 90 days, but I tell you it was pretty darn close. It’s a good thing I like rice and beans! First time trying sopilote (vulture meat). Ooops, wait! That was chicken and a couple of colleagues trying to trick me. But in any new experience, it’s always the people you meet who make all the difference. While I love to travel and see new places, I also love the very different experience of living abroad, because that’s when you really get to know the locals. People asked me why I wanted to come to Costa Rica for my fellowship. In fact, it’s somewhere I’ve wanted to go for a long time. I have always been intrigued by this country that constitutionally abolished its army in 1949, thus diverting resources towards health and education for the general population. I was curious about the nation with a long history of ecotourism that today remains one of the world’s leaders in environmental protection. I wanted to meet the people who lived in the country that was ranked #1 in the 2012 Happy Planet Index. Ticos are proud of their country and have a strong sense of national identity. The expression Pura Vida (Pure Life) says it all. It’s something of a national motto here, but it’s more than just words; it’s a way of life. It’s used here in greetings, as an expression of gratitude or satisfaction, and also to describe something or someone who’s generally pretty awesome. Beep beep! You go first! Beeeeeeeep! I’m stuck in traffic and mildly annoyed. Beep! I’m bored and tooting my horn is fun! Ticos love their coffee. As they rightly should: Costa Rican coffee is really good! Even for someone who’s more of a tea-aholic, two coffee breaks a day will get you hooked in no time. If you search long and hard, though, you will find some tea aficionados, and you might even chance upon a tea store if you’re lucky. Costa Rica is largely rural. Like the diminutive Tico suggests, things here are small-scale. Even the bigger city centres are more like large towns. Many Ticos live in rural areas or have some connection to rural life. For example, quite a few people who work in the city commute some distance from a more rural area, or their family might own a finca (a property in the countryside). And many Ticos and tourists alike are averse to San José, whose metropolitan area has some 2.3 million people. While it may not be the world’s most attractive city, the Ticos’ dislike for it stems more from the fact that it is a city. I am going to make a bold statement: I like San José. That may be attributed to the great people I met while I was living here, though. Ticos are quite devout. Costa Rica is fairly homogenous and its population is made up of 70% Catholics and 14% Evangelical Christians. It was interesting trying to explain that my family’s roots are Buddhist, since Buddhism, like many other religions, has had limited exposure in Costa Rica. It was also interesting being introduced as Canadian to new Ticos. Their eyes always said the same thing: You can’t fool me. A further explanation of my parents’ Japanese origins brought a sort of relief to their faces and often facilitated the conversation that ensued. I was, without a doubt, something of an anomaly to them, although that humoured me more than anything. In addition, there is a type of flower called china and porcelain plates are also called china. To add some variety, I tried to make up my own word, chinesa, to describe the language, but I was corrected. Por favor. It’s china. That being said, China (the country) has become Costa Rica’s most important ally after the US, as evidenced by the generous gift they sent last year. (A symbol of its former relationship with Taiwan can also be found firmly planted in northern Costa Rica.) So maybe it’s good that, as long as they’re going to use one generic word to capture all these meanings, that the word be china. These MFIs are doing a great job of providing opportunities to people in rural areas, where the poverty is often striking, but urban poverty is rampant as well, and sometimes microfinance can overlook this. One of my colleagues pointed out that a person is probably better off being poor in a rural area of Costa Rica, because at least then they can still produce their own food. In the city, on the other hand, if you don’t have money you can’t survive. Recently, I had the opportunity to get to know a lady here in a similar situation. While she had a job in the city that gave her enough income to support her family, she was in a position where she could not access credit from the regular banks. As such, her daughters would never have the chance to pursue a better education so that they might someday be able to get ahead. As we chatted, I realized that rarely had I met someone so wise and open-minded. She had a lively curiosity, and she had come to grips with her situation in life with laughter and a positive attitude. She left me with a feeling of admiration mixed with heartache. Over the past 10 years, I’ve had the fortune to live and work in 7 different countries, and travel to countless others. Throughout those experiences, I’ve met friends who come from over 70 countries, and I’ve come to understand so much about the world thanks to them. Ticos, I’ve learned, are totally pura vida. And hopefully, they’ve learned something about me, too, so that the next time they meet someone really different from them, the differences won’t be as striking as the similarities are. Eileen and Irene are both fellows in India. Eileen is living in Imphal, Manipur and Irene is in Bhubaneswar, Odisha. While in conversations with one another, we have been struck by how different the cities are. We’ve compiled these observations to share with you our experiences of the rich and diverse culture of India. Eileen’s profiled in Part 2 below, while Irene is featured in Part 1. Relax, get comfy with a cup of chai to enjoy the flavors and hospitality of India. Top 3 things that you notice while roaming your neighborhood? Rickshaw drivers in disguise. I was perplexed why most of the rickshaw drivers were covered from head-to-toe with only eyes showing, even on very hot days. I learned that these educated young men were forced to take this job because of the high unemployment in this region. It’s considered an act of shame for themselves and their families if their identity was known. Men with large guns. Sadly, this has been a hotbed for militancy for decades. At any given moment, I’ll see men in combat uniforms jammed into the back of a vehicle or a crew taking a break at a paan shop or a tank slowly cruising down the street with the watchman’s bust out the top. Kids in uniform. I live right across the street from a primary school and my favorite morning ritual is to watch them all gather with the last bit of wild exuberance before the subdued day ahead. Children arrive scrunched with siblings on bikes, rickshaws, or father’s shoulders. Sisters eagerly tie younger one’s bows, friends connected by sweet hand holding and boys arm and arm while imitating their favorite cricket bowler. The view out my window in Imphal, Manipur. When you want the “comforts of home” experience, what do you do? I live with a family that has two young boys, so I’ve taught them some American card games like Go Fish, Slap Jack and Crazy Eights. On chilly nights we obsessively play with gusto, which always makes me happily nostalgic. Although, when I’m really longing for home, I head to the best hotel in town to have a cappuccino and baked yogurt, which is a newly delicious discovery that is a cross between a crème brûlée, and American style yogurt. Although I appreciate the ritual and social nuances of chai time, there’s nothing like the comforts of a cup of coffee or two, to turn my day around. Added bonus is this cafe plays the most wonderfully bad acoustic remakes of American songs. Depending on my mood, I am either really happy or deeply embarrassed that I now know all the lyrics to Rhinestone Cowboy. Describe the people and culture in your region. Manipur is one of the most northeastern states of India, snugly positioned next to Myanmar, formally known as Burma. Almost all states in the northeast have international borders with countries that include Nepal, Bhutan, Bangladesh, Myanmar and China which has meant a continuous migration of people with strong ethnic identities. The amalgamation of different tribal nations, indigenous traditions, languages and food has left a dynamic imprint on the Manipuri culture. They have a rich arts heritage, however my favorite pastime is the daily theatre of weaved garments whisking by in the streets, with just the right amount of dramatic flair. Most women don’t wear saris but a long wrap-around skirt that tell a story of the woman, her home tribe and religious lineage through the intricate patterned design, electrified colors and weave techniques. I love Indian food and its explosion of spices to awaken an exotic, far-away feeling in me. However, one of my biggest surprises has been with my culinary experiences. It’s not your typical Indian fare of masala, cardamom, coriander and the like, with the exclusion of turmeric, spices are used minimally here, if at all. Manipuris smother everything with the king chili (the hottest in the world) and say that “rice is always the main course” with something fermented (fish or bamboo) and possibly dried meat as a side. Thankfully, my host family has been understanding of my western palette and doesn’t try to push the king chili on me, as I think we both know it would end badly. 1) Naga Village skirts 2) Classic Meitei design 3) Kuki pattern called “elephant knees” 4) Very common vertical stripes with border design. 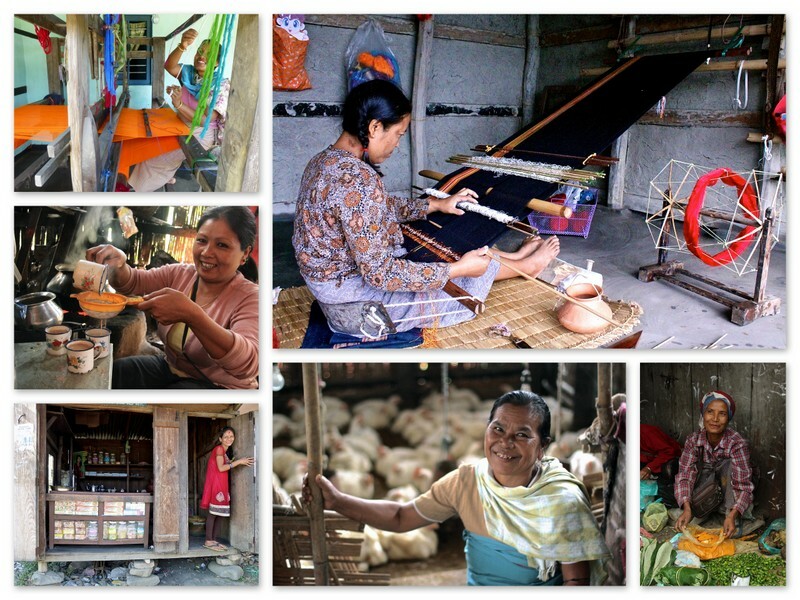 What type of work is common in this region for Kiva borrowers? All village women will be involved in these three activities. Weaving is done twice daily, at dawn and late night when all the other household chores are completed. Rice harvesting is only once a year and the yield is not only expected to feed the whole family throughout the year but provide a small supplemental income. A majority of families, regardless of income level, have a paddy field that has been pasted down through the generations. In addition, village families will have anything from a kitchen garden to a full farm. In this region, they typically grow potatoes, gooseberries, ginger, turmeric, cabbage, chillies and will use the harvest for family consumption and market sales. “Piggeries”, as pig farms are known here, can reap a good profit, especially around festival time when the demand is high. Ladies will spend about 8-9 months feeding their pigs from scraps from their garden and rice paddies. In most cases, a woman who is raising pigs will be raising chickens,too. This is because chickens, like pigs, are a home based business and can be sold within 4-6 weeks, allowing the Kiva borrower profit to live and pay back the loan while waiting for the income from the piggery. The resale of used clothing has provided a good living for Kiva borrowers here because of the high profit margins with less time and hard labor then other activities. In addition, tea stalls, paan shops and variety shops are heavily littered throughout India, but in rural areas they are still viable means to respond to village needs. What are the main strengths of your MFI and how have you experienced these in the field? Kiva’s partner, WSDS-Initiate, has many strengths that contribute to successfully penetrating the remote regions in the northeast. Manipur has several challenges and complexities that make it difficult for financial institutions to operate. Which of course, compound the effects of social, political, and geographic circumstances by widening the disparities in rural populations by financial exclusion. WSDS- Initiate, has a long history of working in this area, not only in a financial role but a social services capacity and understands the ethnic conflicts and nuances needed to work with many different tribal communities. They operate with an inclusive approach that tribal harmony and peace-building is pivotal to the regions long-term growth. Therefore, they work with the three major tribes (Kuki, Naga & Meitei) in remote and sometimes dangerous regions with a needs-based approach to financial inclusion. This includes, not only providing loans, but financial training and savings education. I’ve personally met hundreds of WSDS clients, in several villages and have witnessed how they work to financially include and educate all women, even those that are considered “too high risk”, such as widows, women over 55 years old and those with little collateral. In addition, I’ve been particularly inspired by how they continue to strive to make a social impact in this region, which isn’t easy. They have partnered with organizations that are using innovative ways of enhancing their client’s livelihood activities by enabling them to get better access to solar power, education, agriculture and forestry projects that benefit the whole community. It’s clear that WSDS’s investment in these villages are holistic with the overarching driving principle of poverty alleviation. The incredible WSDS staff hard at work visiting borrowers, collecting stories, group photographs & of course, taking a chai break. Eileen Flannigan is a Kiva fellow (19th class) serving in Manipur, India with the micro finance organization, WSDS Initiate. Support our Indian partners here, join the Indian lending team, WSDS lending team or get a holiday gift card for someone special! Eileen and Irene are both fellows in India. Eileen is living in Imphal, Manipur and Irene is in Bhubaneswar, Odisha. While in conversations with one another, we have been struck by how different the cities are. We’ve compiled these observations to share with you our experiences of the rich and diverse culture of India. In Part I, we start with Irene in Odisha and continue with Eileen in Part 2. Borrower groups at Tujijenge are made up of around fourteen members who know each other, though there may be as many as twenty or as few as eight. Groups choose their own names – and names run the gamut from the practical “Mt Rungwe”, to the motivational “Breakthrough”, and confident “Top Class”. Their names are just the first indication that each group is unique… It’s been immediately apparent when I’ve met them that each group has it’s own personality: some are shy and quiet, others cheerful and full of energy! while a third raises (inquisitive) ducks! Group members don’t all borrow the same amount as one another either – each member’s loan amount is dictated by both the amount they requested and their personal loan history at Tujijenge. I’ve participated in a number of Group loan disbursements at Tujijenge’s main branch. I’ve been delighted to meet members on their tenth loan cycle, borrowing Tsh 1,800,000 (about US$ 1125), because it confirms for me that the loans provide genuine benefit. I’ve been equally happy to meet members who’ve only recently joined a group and are on their first loan cycle, borrowing Tsh 80,000 (about US$ 50). Wait a minute…. surely that can’t be right? $ 50! I’ve never seen an Individual loan for $ 50 on Kiva. And this is precisely the point: Group Loans are special. They enable borrowers to start borrowing. Group loans also provide a good environment for nurturing new borrowers. Established group members can help new borrowers learn the skills and discipline associated with repaying a loan, all within the safety-net of the group guarantee. And, I was fascinated to learn, a Group is a self-regulating mechanism against the scourge of over-indebtedness. Group members actively discourage each other from taking out simultaneous loans from multiple organizations because they know they’ll personally be on the hook for paying back the Group loan if a fellow member cannot. Then there are the intangible benefits to a Group loan that I’ve discovered while attending Group meetings! Groups meet on a weekly or bi-weekly basis in a location convenient to them (but that entails several hours’ journey on a hot and supremely overcrowded dalla dalla for the Tujijenge loan officer and Kiva Fellow…), to register repayments with their loan officer. At one meeting, I ask the Group Chairman if hers is a tough job and she sighs: “Yes, following up with members who haven’t repaid is the hardest part.” I ask her why she’s persevered in the role for five years, and she answers without hesitation: “Leadership!” She’s referring to leadership within her group, as well as within her community. It’s her very practical way of bettering the community in which she lives. Likewise, the young Treasurer is demonstrating her accounting skills and acting as a role model to new borrowers within the group, whilst also developing her status outside it. But it’s not just idle chit chat at a Group meeting; the support members gain from one another is so highly valued that many well-established borrowers choose to stay in a Group long after they are eligible for “graduation” to an Individual loan. In this case – and in a nice paradox – the Group loan enables borrowers to access some of the largest loan amounts on offer. So chalk up one more winning attribute: Group loans empower the borrowers that started with them to keep moving upward! If you’d like to loan to Tujijenge’s Group borrowers, you can do so here. As we say in Tanzania: Karibu sana! You are very welcome!